For 2015, Burnside Forge Racing Division was delighted to welcome Wayne Lewis to our team. He also helped us to expand our team presence into the world of cyclocross. We have represented from New England to Virgina and North Carolina, and have collectively had a race in all 12 months of the year. I would like to thank our generous team sponsors… People’s Bicycle, Rushing Duck Brewing, American Icon Screenprinting, and Vince Vennitti… Your support is greatly appreciated! Wayne had a solid season on his 2 new bikes, first in XC where he stood on the podium 3 times in 7 races (including a 100-miler and a win at cathedral pines in coed teams) and finding his stride in cat1. He continued straight into CX season, working hard over 19 races to earn up to cat3, and finished with a trip to nationals in Asheville to close out the season. 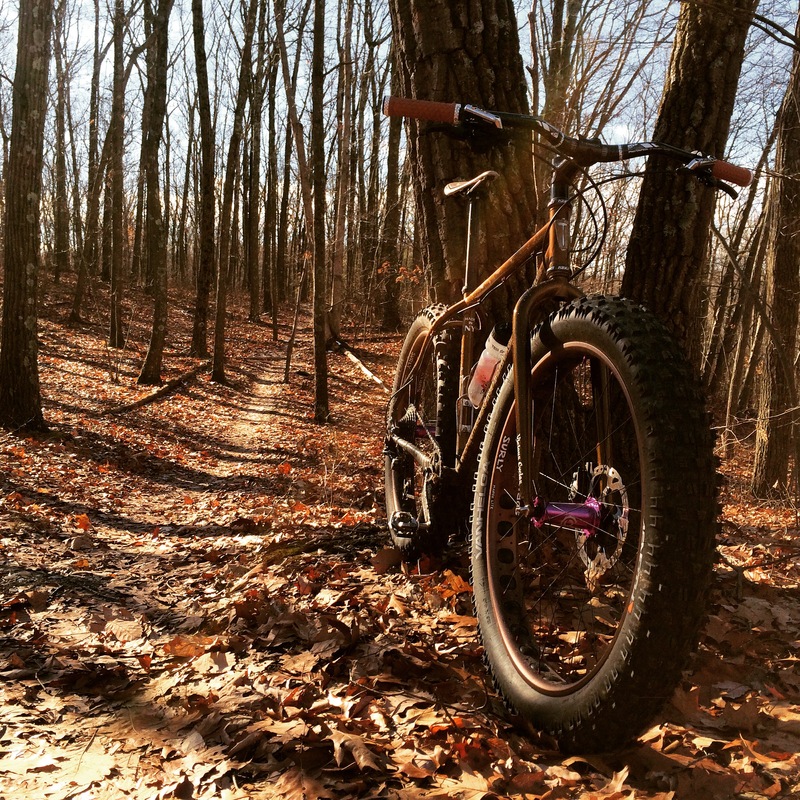 Cima came out swinging last February with a 5th place finish at Marty’s Fat 50, then followed with a win in the fatbike category at SSAP, and then 6th at the Bearscat 50 in Singlespeed. His season was going great, but by mid summer he was sidelined with a case of Lyme’s. But you can’t keep him down, Cima has recovered and will be back in 2016 with a vengeance. Personally, I felt 2015 was a great race season. 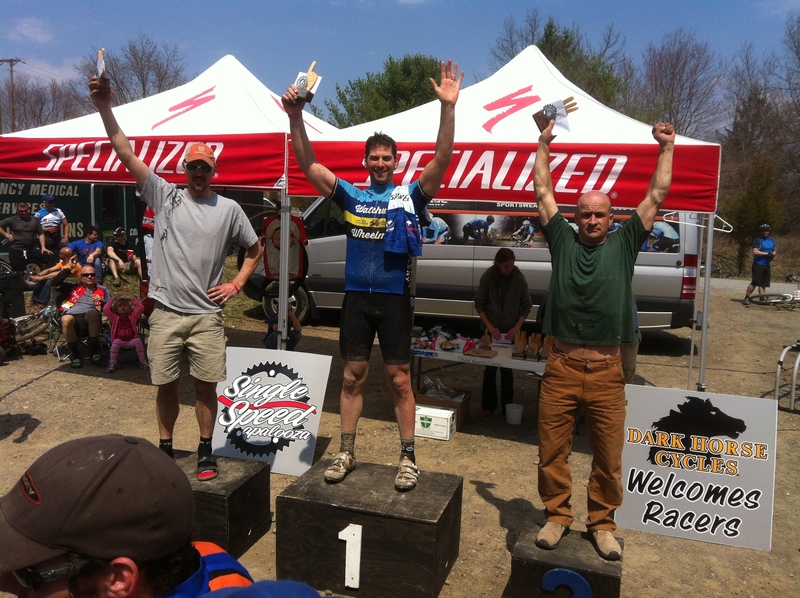 A total of 33 races, 16 podiums, and 8 wins, and the NYS mtb series cat1/open Singlespeed title…. Ironically, looking back, my most memorable and exciting races were all 2nd place finishes… at the Stewart 45 in coed teams, Windham World Cup, and the ss race at CheshireCX. Banging shoulders, hitting the wall, and then going over it. It’s about the fight, the fun, and the spirit. Can’t wait to see what 2016 holds! 2015 was a big year for Burnside Forge. It’s been a while, so I’ll show you the bikes and follow up with another post highlighting our racing. Wayne and his lovely wife Kim beside his new frame .010. 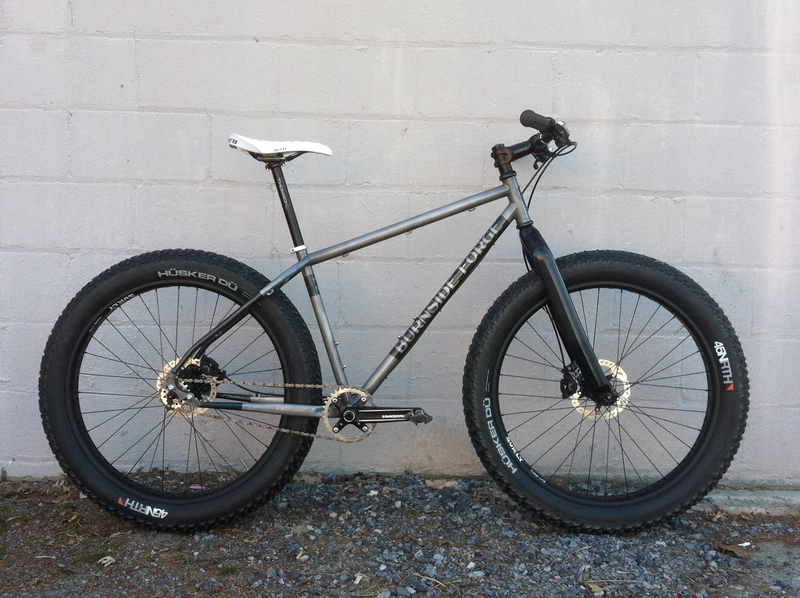 Singlespeed and dedicated rigid with steep geometry deigned for one purpose. Wicked and sharp, this XC race slayer weighs in at just over 21lbs as pictured. Chris’ trick fatty #.011. Built for 4″ tires and nimble XC prowess, this frame has a 44mm head tube, rocker dropous, and a seat tube for a 31.6 dropper. Color matched to blend in next to his monster Jeep Wrangler. Wayne came back for a sweet cross bike, #0.13. Gotta love the simplicity of a rigid Singlespeed. Build from Columbus Life tubing around a carbon TRP fork, nothing between you and the ground here but silent, subtle compliance. Rounding out the year of fabrication, here is my own personal cross bike, frame .012. Almost identical to Wayne’s, the only difference being that I painted my TRP fork (that holds a 15mm thru axle for mtb hubs) and I included braze ons to be able to run gears in a 1x setup. I fell in love on my first ride…which just happened to be a crisp Saturday morning at GP Gloucester. 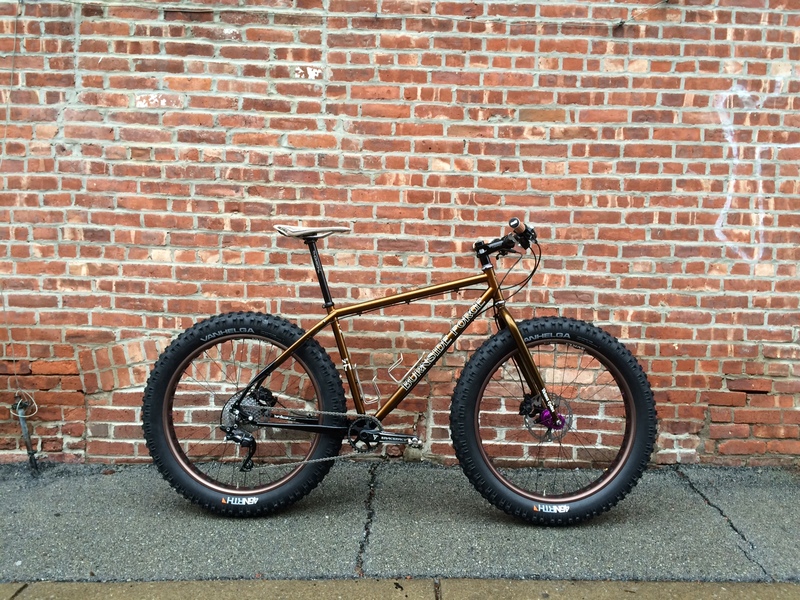 Almost a year in the making, I finally completed my own fat bike back in December. Our trails here in southern New York stayed clear or with minimal snow until maybe mid-January, and riding was fantastic. 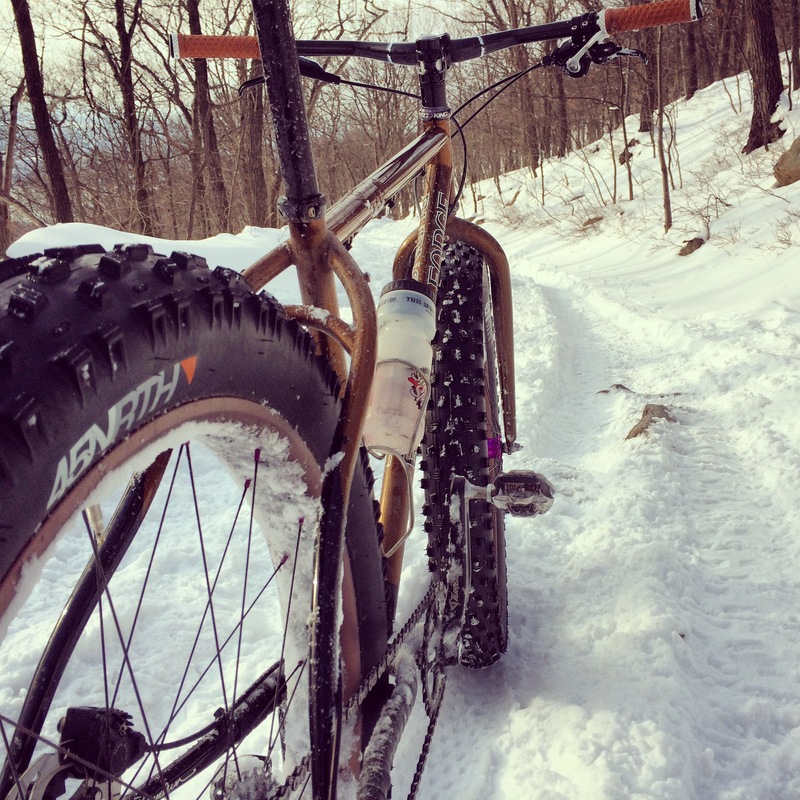 This bike felt largely like a regular hard tail mountain bike, but with amazing traction. Mind-blowing, unbelievable traction everywhere. Then it started snowing relentlessly, and with constant low tempetures, the snow never left. This bike allowed me to keep riding in the woods the whole time. Adjusting tire pressure to the conditions for float and traction is key. Overall it has been a great winter tool, and addition to my arsenal. 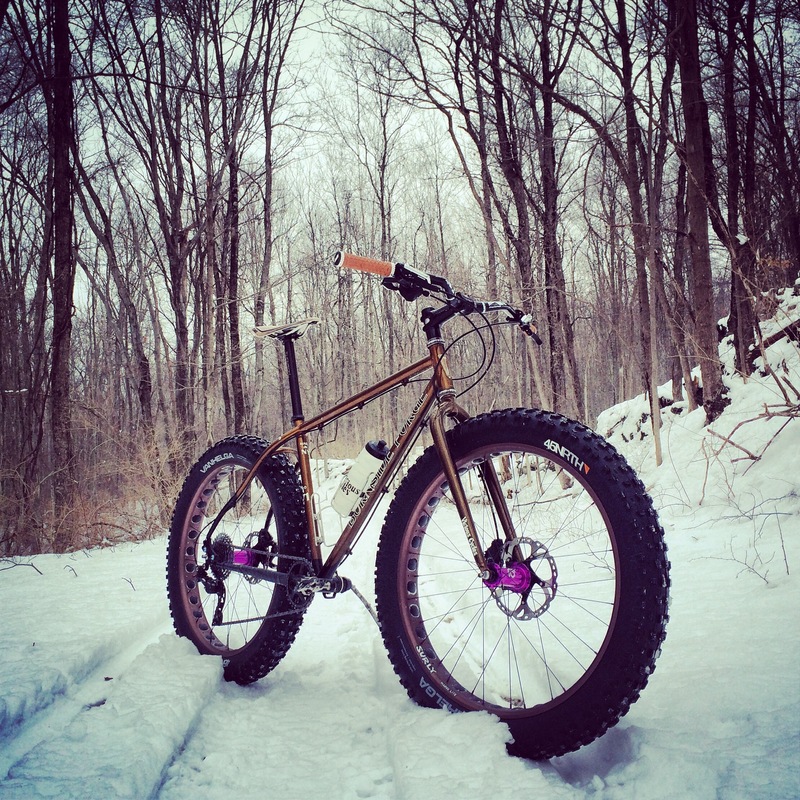 Riding on snow is great fun, but riding clear trail and mixed conditions was where this bike had me smiling the most. 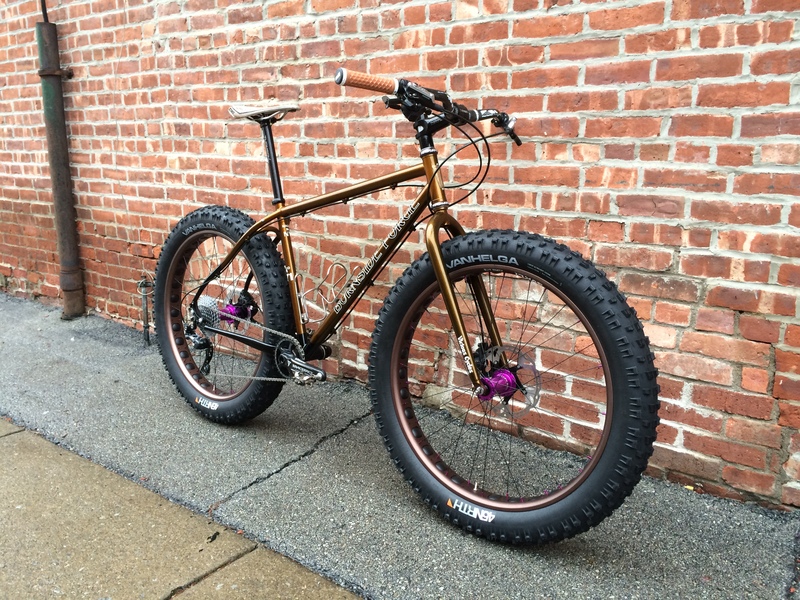 If I had to choose one bike for year-round use, this is it. When fabrication of Cima’s bike was completed back in April, we needed to build it up in time to race at Singlespeedapalooza…which meant putting off paint! I put the finish on in my basement the night before bolting all the parts on, and it consisted of masking off the lettering and using cold gun blue to create contrast on the bare metal, and then brushing on a coat of straight Penetrol. It looked amazing, but not for long…just long enough for Cima to fall in love with the color scheme. I finally got the bike back a few weekes ago, stripped it down, and tried to replicate the same look with paint. The finished result can be seen above, and right after completion we drove the bikes down to NYC to spend the day tearing around the city. A hell of a way to christen a bike reborn! 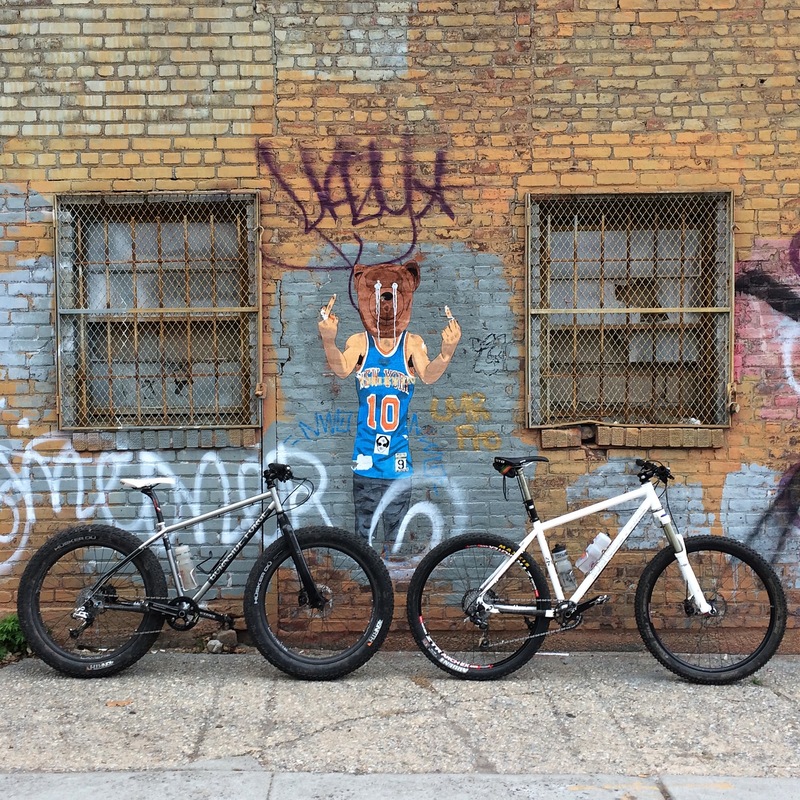 With the backing of Peoples Bikes of Beacon and Rushing Duck Brewing of Chester, Cima and I teamed up to take on the 2014 race season as Burnside Forge’s Racing Division. The majority of our efforts were racing Cat1 single speed in our local race series, NYS and H2H. 14 races within 2 hours of Newburgh, between the 2 series we had an amazing cross section of terrain and competition that went from April to September. In early July we bolted on gears and teamed up to win men’s open teams at the Stewart 6-pack. The following weekend Cima went out to Bear Creek PA and took 12th at Nationals in Cat1/open single speed on his fatty! When all the smoke cleared, Cima got 2nd and I got 3rd in overall points in the NYS series, and I also got 3rd overall in the H2H series (which came down to a tight 2nd place finish in the final at Tymor)…and between the 2 of us, Burnside Forge stood on the podium 15 times this season! 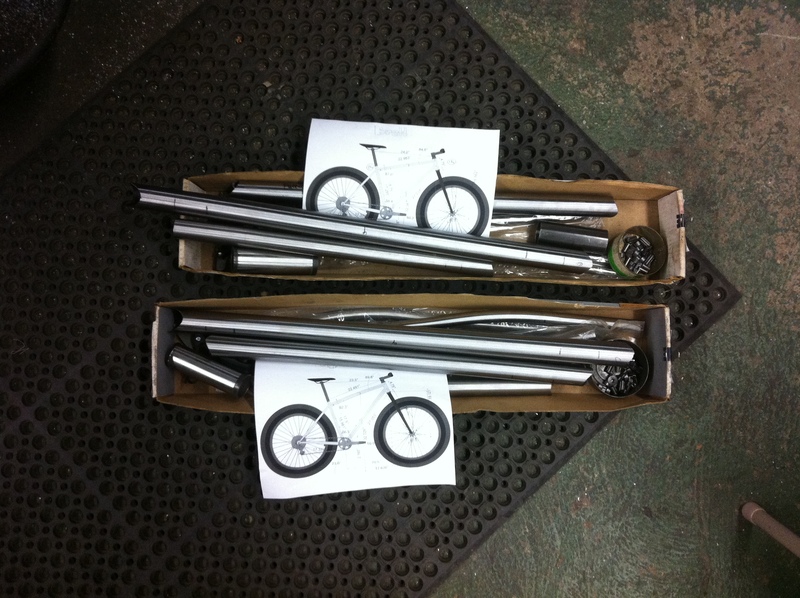 Huge thanks to Jon and Sarah and all the guys at Peoples Bikes, as well Dan and Nikki and the crew at Rushing Duck. Keeping your bike in top shape and being fueled by excellent craft beer is paramount to any mountain bike racer! 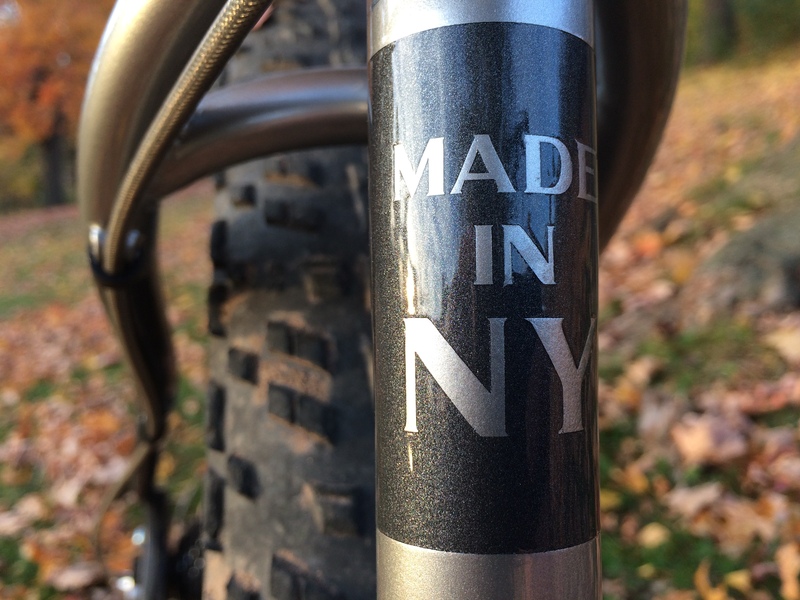 On April 13, Dark Horse Cycles put on the 6th annual Singlespeedapalooza at Stewart State Forest, right here in Newburgh, New York. This is a great event every year, and for most, unofficially kicks off the mountain bike racing season. I was working late nights and early mornings to complete frame .008 in time for Cima to debut it at the race. And what a debut it was! Cima raced it for the first time, only a couple days after it was built up, and landed solidly on the 3rd place podium in the fat bike class. What a way to start the season! The build included a carbon Carver fork, cockpit by Thomson and Answer, and custom wheels built by Kyle at Peoples Bikes in Beacon, using I9 hubs and Surly Marge lite rims. After a rough ride at Blue mountain, we decided to convert the rear to 177×12. Just a call to I9 for hub conversion endcaps, and another to Paragon for the dropout inserts and Shimano thru axle and we were good to go. The beauty of simple versatility. As the temperatures have finally risen into the double digits and the snow has settled as a 2′ deep blanket here in New York, we are grabbing our bikes and crawling out of our caves. 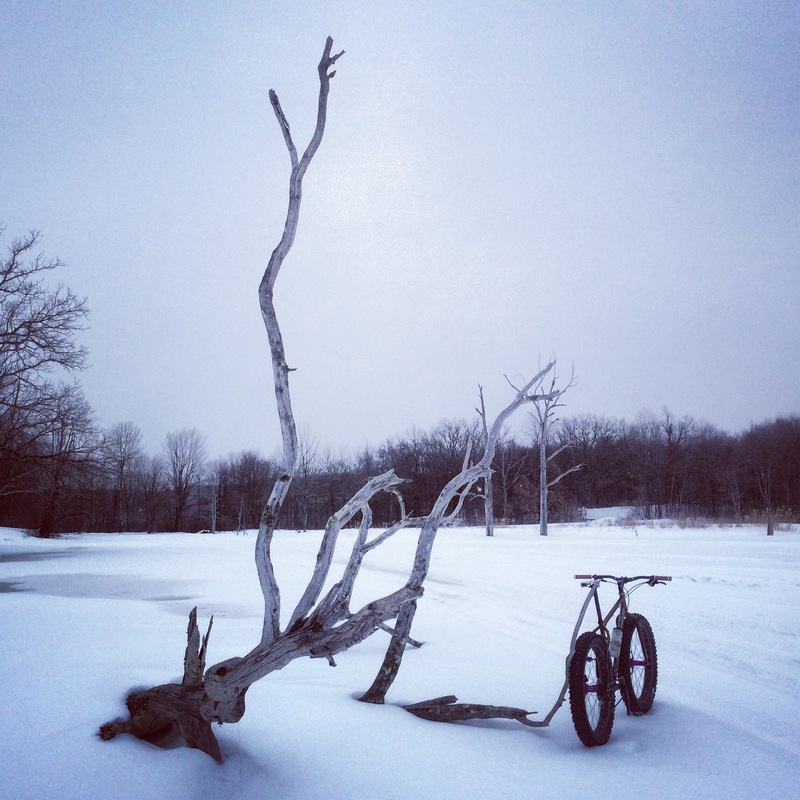 Riding this time of year around here is pretty limited to roads covered in sand, salt, ice, and water…unless you have a fat bike. I’ll admit, this is all pretty new to me. After a few rides on a borrowed bike, I was sold. 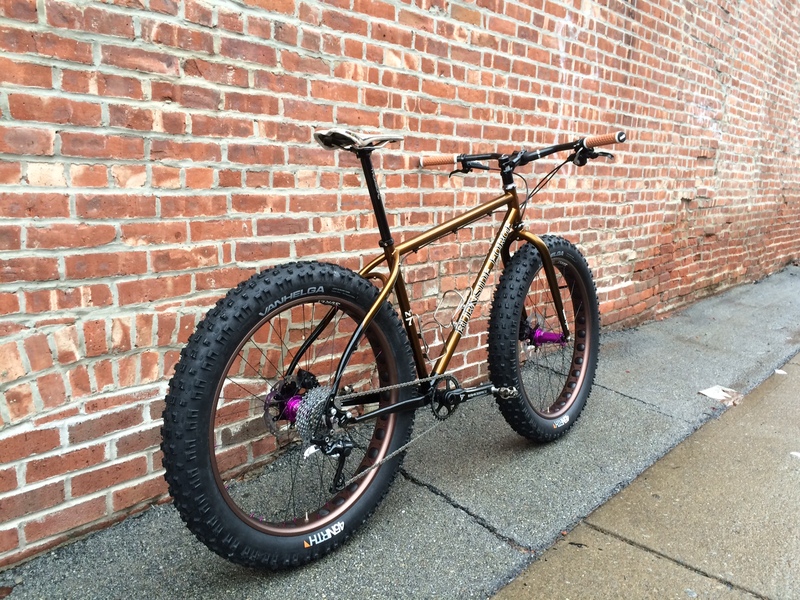 Fat bikes are the monster trucks of bikes. Big squishy tires climb over everything with unbelievable traction, and float over otherwise impassable trails. When my friend Cima expressed interest in having me build a new fat bike for him for this coming season, I was really excited. So much so, that I ordered 2 tube sets and plan to build one for my own arsenal as well. We took all that he loved from his current bike, and changed all that he didn’t. OX Platinum tubing, 170mm rear spacing, paragon rocker dropouts, 1×10 drivetrain with top shelf parts… This will be a sweet bike. Cima’s a one-bike guy, and he’ll be racing every weekend from the end of march until the end of September on this bike. And because he ran in both Cat 1 geared and Cat 1 SS last year, he wanted the flexibility to switch back and forth during the season. And then train all week and off-season on this bike, for several more years. He mentioned he may want to do a big tour on it one day too, so there’ll be rack mounts and fender mounts integrated as well. The goal was to build a lively, durable frame that would last reliably for many years to come.